Some brides just take your breath away, and this was a weekend full of them. Sam was such a sweet natured and well rounded lady. I loved her vibrant personality which we echoed in her flowers. Funky but natural, textural yet coordinating, rich and vibrant. Sam's bouquet was in a more natural handtied style I call a sprial handtied. It's made in the european fashion where it can literally stand on it's own without a vase. Benefits? It's more balanced, creates a natural feel, and is easier to carry (especially for those really heavy bouquets). 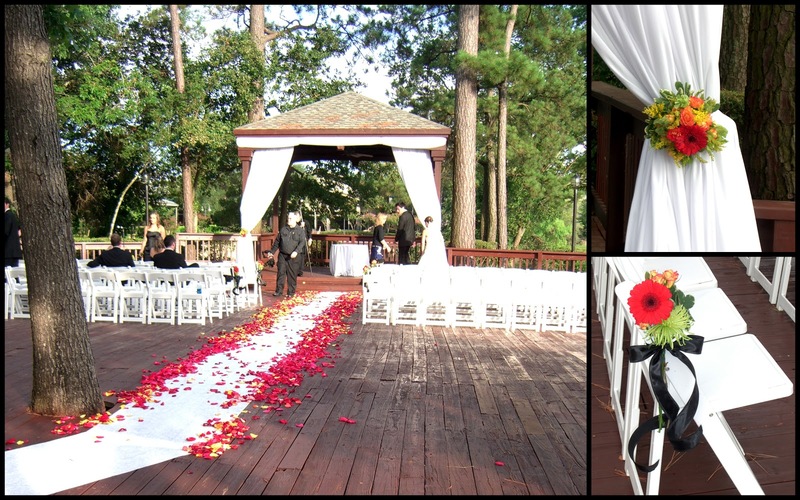 We mixed miniature green hydrangea, red gerbera daisies, yellow tulips, circus roses, bells of Ireland and a mix of greens to get this perfect color combination that was truly reflective of the couple's bright future. 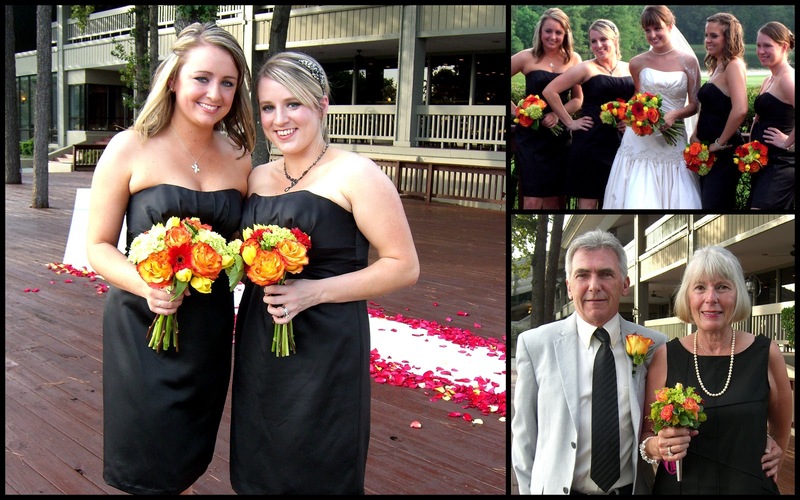 We created smaller mimics of the bridal bouquet for her attendant, which against their black dresses looked absolutely fabulous! The mothers also carried small bouquets called tussie mussies in silver holders, while the men were dressed up with a rose and bells of Ireland blooms with wire accents. 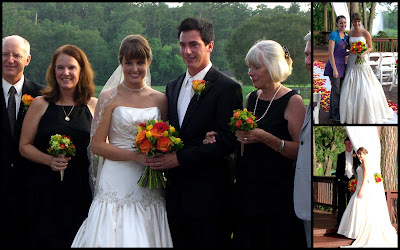 One of Sam's attandants approached us after the ceremony and secretly whispered "I really should have come to see you guys for my wedding, if I had only known." What a wonderful compliment, so Thanks! One of my favorite parts of the ceremony decor was the heavy spread of rose petals in vibrant reds, oranges, and yellow hues. The Father of the Bride told me that as tthey turned the corner to walk the last 50 feet of the aisle they couldn't help but take a second to smell the lovely fragrance from the petals. 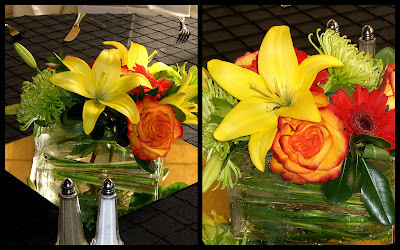 Her centerpieces were untraditional in shape and vibrant in color. We used oblong rectangles with grass accents in the vase. The vibrant colors against the black diamond pattern table cloth was the perfect contrast to really show them off. She was such a pleasure to work with and we sincerely wish her the best of luck and hope to see her again!